The Philadelphia Economics Internship Program at SJU is a three-way partnership between a student intern, an employer, and the faculty mentor. SJU is committed to the academic component of the student internship. The intern’s professor will work closely with the student and the employer before, during and after the 13-week internship. As a result of this three-way partnership, both students and employers will maximize the benefit they derive from the experience. 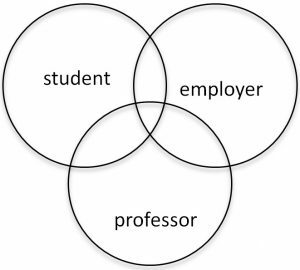 -A student must meet with a faculty mentor as soon as an agreement is reached with an employer. The student is required to research the employer’s position in the industry and in the local Philadelphia economy. -While working for 10 hours per week, students are responsible for keeping a daily work journal, reading an academic book related to their work, write a book review, and at the end of the internship, submit a paper on the integration of the internship experience with academic content. -The faculty mentor will foster a meeting between old interns to share experiences and advise new potential interns. -The faculty mentor will contact the employer for an evaluation that will lead to improved future internship placements and experiences.